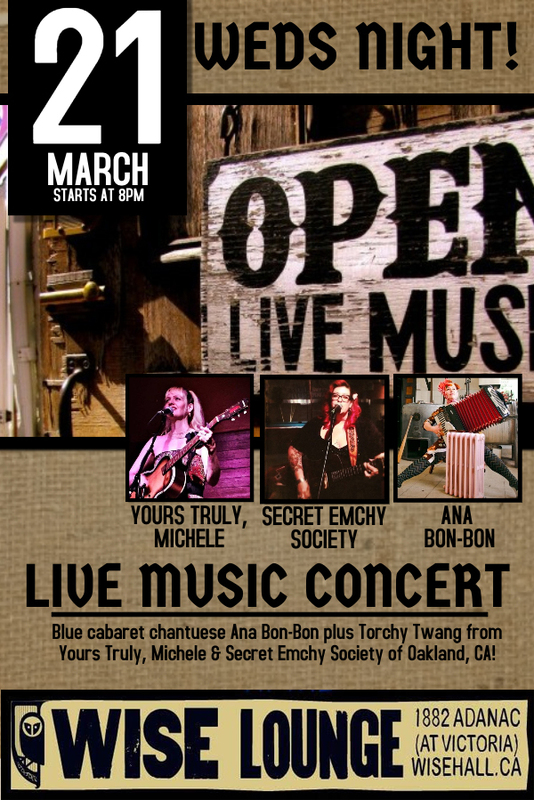 Join Blues Cabaret Chanteuse Ana Bon Bon, the first lady of queer country Cindy Emch (Secret Emchy Society), and torch song singer Yours Truly, Michele for an intimate night of rootsy americana music on Wednesday March 21st at 8pm. It’s going to be a boot stompin’ heart breakin’ triple twang line up of intoxicating western cabaret at the WISE Hall, not to be missed. Cindy Emch from Oakland, CA is the “Emchy” at the heart of the “Secret Emchy Society.” She writes and performs cowboy songs, drinking tunes, and old-school country music. In 2017 she was named by Huffington Post as the “First Lady of Queer Country,” by TheBoot.com as one of the Top 10 Queer Country Artists to check out for REAL country music fans, and had her 2017 debut album listed by the Atlanta Auditory Association as on of the top 50 of the year. As a fixture of seminal Bay-area Americana-inflected bands such as Vagabondage, Rhubarb Whiskey and The Oakland Wine Drinker’s Union, and former Accordion Babe, Emch is touring to support her new album ‘The Stars Fall Shooting Into Twangsville’ which was recorded in Victoria, BC and features Carolyn Mark, Tolan McNeil, Grayson Walker, and more. Yours Truly, Michele, may best capture the heady mix of influences and experiences she can bring to any party simply by showing up. With a sound infused with 60s pop, shadowy torch songs, and touched by Americana Roots-Rock, it is truly Michele Kappel’s own brand of music. She co-founded the Garage-Pop Alt Rock band The Kirby Grips (Sympathy For The Record Industry), performing behind the drum kit on national stages including at Noise Pop and CMJ. When The Kirby Grips paused for an indefinite amount of time, Kappel created ukulele-toting folk pop artist Tippy Canoe and started writing her own melody-rich songs, inspired by influences as diverse as Squeeze, Ray Price, and the Spector Wall of Sound. More recently, Kappel incarnated as one-half of the close-harmony, country-tinged, impeccably decked out duo, Heartache Sisters and was behind the drum kit with classic country band Laura Benitez & the Heartache. YTM, however, puts Kappel’s style, substance and well-honed musical sensibilities front and center. “No matter your mood, you’ll walk away with a smile. It’s cheaper than therapy." Tony DuShane at The San Francisco Chronicle wrote of a YTM performance, which by turns can evoke Debbie Harry, Erin McKeown, and Patsy Cline. The “exotic prairie gospel” of Ana Bon Bon is not to be missed. Chanteuse, accordionist, songwriter, and musical hostess, she delivers an intoxicating dose of jump blues, western swing, cabaret, spirituals, and double-entendre lyrics all wrapped up in one big wood-choppin' gal with seasoned vocals and a bump'n'grind squeezy-box. A countryfried and mountain-whipped genre-bending performer, she squeezes savoury rhythms from her saucy bellows box to bring joy and comfort to those in yearning. An Ana Bon-Bon performance can transport you to the rollicking music hall stages of the 1900s or a country juke joint on a sultry summer afternoon. 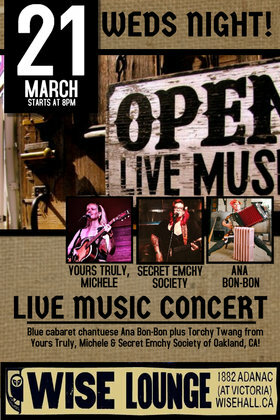 Bon-Bon is naturally cabaret with a raw blues constitution.